In act I, scene 3 of Othello, the 28-year-old Iago upbraids his supposed friend Roderigo for threatening to drown himself over his unrequited love for Desdemona, who has just married Othello. Says Iago, "​I have look'd upon the world for four times seven years, and since I could distinguish betwixt a benefit and an injury, I never found man that knew how to love himself...Come, be a man!" ​Under the pretense of a false friendship, Iago calls Roderigo a fool because he pines for love instead of purposefully, carefully and systematically seeking to advance his own interests by whatever means he can. "Put money in thy purse," he counsels Roderigo again and again. "A pox of drowning thyself, it is clean out of the way. Seek thou rather to be hang'd in compassing thy joy than to be drown'd and go without her." In short: If you want her, and you love yourself enough to believe you deserve what you want ... do whatever it takes, consequences be damned. Throughout all this, Iago—true to the self-love he praises here—is also, for his own reasons, preparing to destroy Othello and Desdemona in any way he can, including manipulating Roderigo, who, as soon as he leaves the stage further along in the same scene, he calls a "snipe But for my sport and profit." And destroy them all Iago famously does, along with many others (including his own wife, whom he murders for revealing him) along with every possible shred of human integrity, saying and doing anything he can think of to achieve his end. Throughout the play he is like a moral suicide bomber: brilliant, witty, cunning and so committed to his purpose of hate and destruction that he is indifferent to any escape plan. 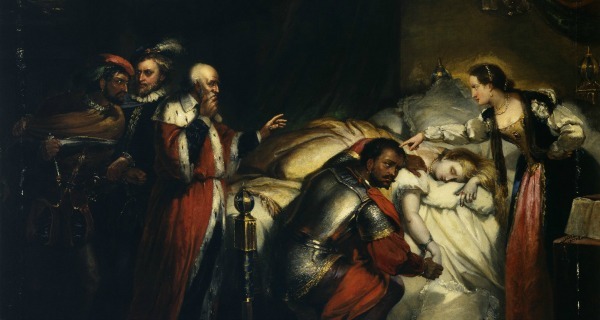 What gives him pleasure is nothing so innocent as Roderigo's mere desire to make love to Desdemona, but rather the consuming sadistic passion to emotionally and then physically inflict suffering on Othello, the master who has passed him over for promotion. No matter how many times I see or read Othello, it always comes back to this, to the character of Iago. His name is the Spanish form of Jacob, the original trickster and supplanter, and Shakespeare's character lives up to the name, with the most malicious intent imaginable. The problem is that he is no simple man, but utterly, inescapably and all too believably human. His narcissism and self-proclaimed self-love are so absolute that he has no conscience about manipulating others, who all believe his improvised lies. He has no scruples whatsoever about saying and doing whatever he can get away with at any moment to achieve his ends. He is a virtuoso of dishonesty, and Cassio, Roderigo, Iago's wife, Desdemona and most importantly Othello all succumb to his malicious resilience. In this endless self-transformation, he becomes richly complex, a multifacted and charismatic monster. The tragic problem? Just as we recognize that humanity in him, we then find him—and must acknowledge the potential for what he is—in ourselves. It is Iago's spontaneous malice, his highly creative hatred, and his ability to spin even apparently trivial facts (a dropped handkerchief, a smile, even an apology) into a rationale for fear, suspicion and ultimately violence that form the core of the play. In a time when it seems that everyone who tells a story may have designs upon us, and when America's public life is filled to overflowing with accusations and counter-accusations of such designs, Shakespeare's great 1604 tragedy of fear, hatred, and rage still presents a shockingly convincing vision of just how far human beings are willing to go to achieve their ends. David J. Rothman is teaching a weekend intensive Reading as a Writer: Othello starting September 8.